After so many nights with bad weather, last evening offered a fair glimpse of the red planet on its distancing away from the earth. Still, the slight wind and lack of good transparency where not helpful to get to an accurate sketch of what Mars was offering last night. Even though I was using a new 10mm eyepiece which gave me higher magnification, the illumination of the surface disk seemed to have decreased since I last observed the planet almost a month ago. Most prominent was Niliacus Lacus next to brighter Chryse. The edge of N. Lacus lining Chryse could not be efined so I could not locate its exact termination. Tempe region next to N. Lacus was evident as a lighter region. The detection of the delicate features of Sinus Meridiani was more challenging last night. 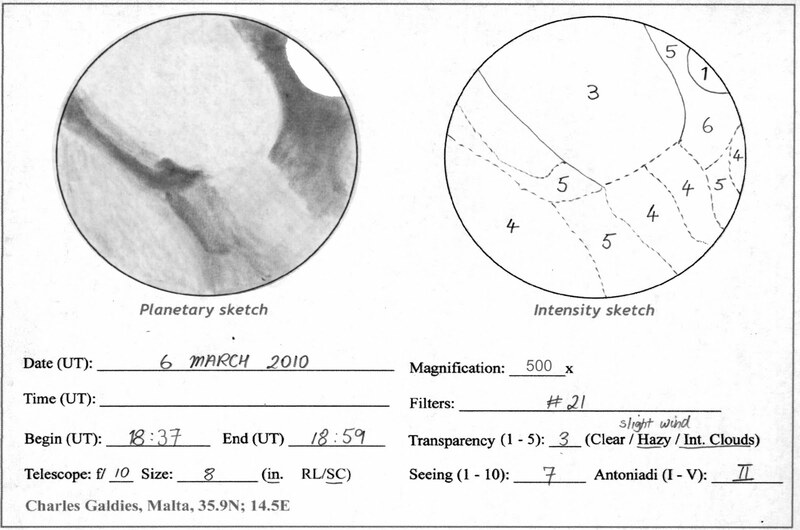 Inspite of the poor transparency the detection of S. Meridiani and its adjacent Margaritifer Sinus extending to Oxia Palus was possible. Pyrrhae Regio was not well defined. Changing to a blue filter did not help much to add significant detail to the above. Your attention to detail is most commendable. Beautiful Mars sketch and it is filled with much detail even as we pull away from the red planet.